What Happens To You When You Quit Smoking and Start Vaping? There are a lot of reasons to switch to a vape from other tobacco smoking products like cigarettes or cigars, but with all the anti-tobacco propaganda out there, it can be hard to tell what are the real reasons and what is just the media hype. We all have seen advertisements screaming about the dangers of smoking cigarettes, but is using a vape really a safer alternative? The answer is a bit more complicated than a simple yes or no, but overall, it seems that yes, switching to a vape from tobacco cigarettes is a good idea. 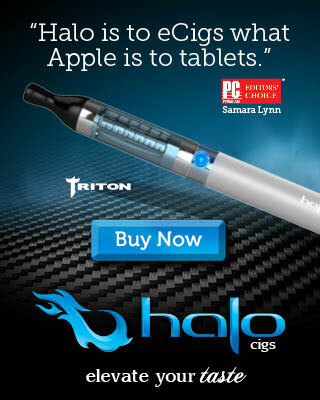 First off, smoking from a vape instead of a pack of cigarettes is resoundingly cheaper, especially in the long run. There are some initial startup costs when you first switch to a vape, but the money you save by not buying cigarettes will quickly overtake the money you invested in your first vape. 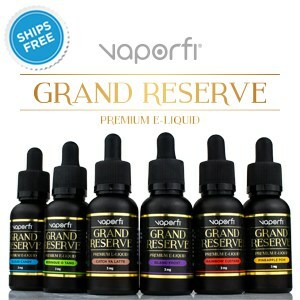 With few exceptions, the vape juice you use to fill your vape is a lot less expensive than the number of cigarettes you would have to buy to accrue a comparable amount of nicotine. Over time, as you reuse your trusty vape and buy juice refills rather than cigarette packs or cartons, you will only be spending a fraction of what you used to spend on cigarettes. Money aside, most people choose to quit smoking and start vaping because of health reasons. But it can be hard to tell what health reasons are legitimate, and which health reasons are just propaganda spin about the dangers of smoking cigarettes. The truth is, using your vape to inhale nicotine vapor is still not 100% safe for your health. The nicotine itself is known to be an addictive drug that damages your body, particularly your body’s production of the protein elastin, which is what makes your connective tissues like tendons and ligaments more elastic. But the biggest impact that diminished elastin production makes is in your skin. Long-term nicotine users suffer from more skin wrinkles and an earlier wrinkle onset than non-users of nicotine do. But this side effect of nicotine impacts all users, whether they smoke tobacco products like cigarettes or they choose to use a vape instead. 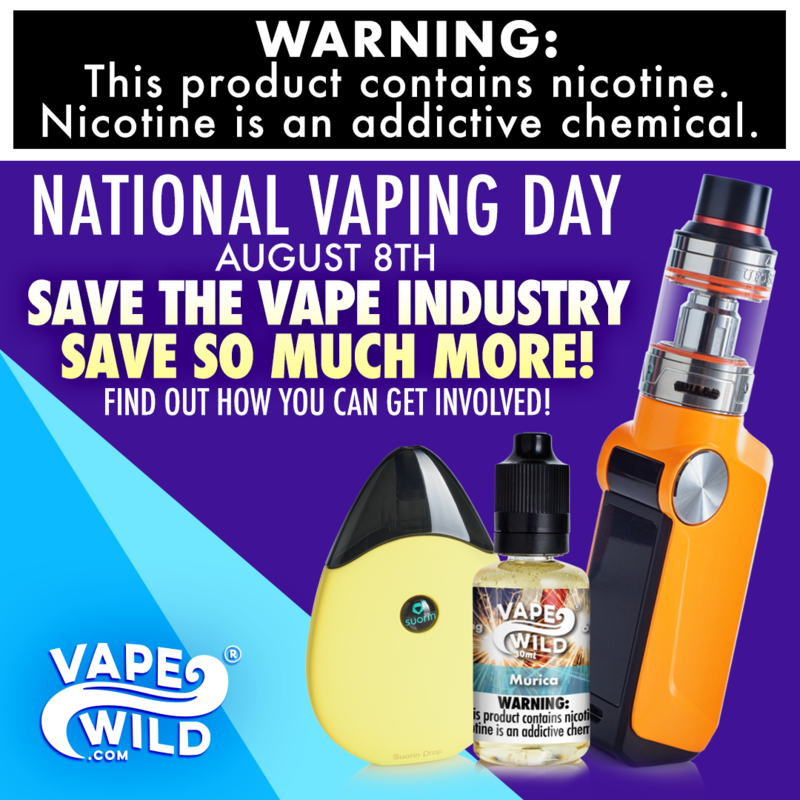 It is important to remember that vaping nicotine is not a safe or healthy alternative to smoking; rather, it is an alternative that is comparatively safer and healthier. While long-term vaping of nicotine products may come to detriment your health, it is not nearly as dangerous as smoking tobacco products like cigarettes directly. Despite being somewhat bad for your long-term health, using a vape to inhale your nicotine is widely considered much better than burning tobacco products like cigarettes to satisfy the same craving. Most tobacco products contain fillers and preservatives in addition to the actual tobacco. Vape juice, by contrast, contains practically no fillers and preservatives. Many major brands of cigarettes contain a number of cancer-causing chemicals called carcinogens, which build up in the lungs over the sustained use of cigarettes. This lung buildup constricts the lungs, making it harder to breathe and turning the lungs that characteristic smoker’s black. 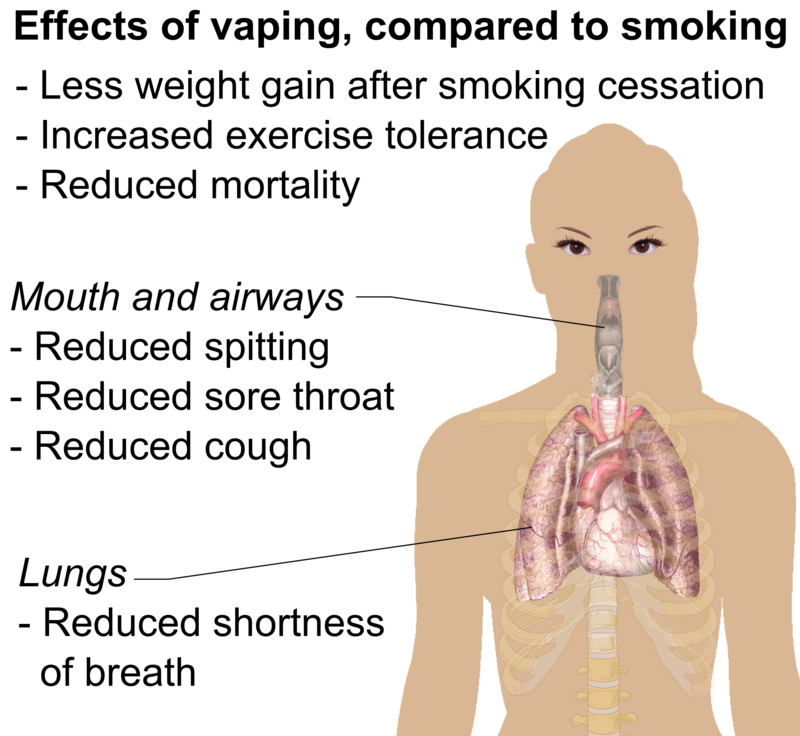 The buildup specifically blocks the tiny alveoli that are the building blocks of your respiratory system. These alveoli are microscopic sacs of air in your lungs, and they are where the oxygen in the air you breathe transfers through a thin membrane to soak directly into your bloodstream. When you smoke cigarettes or other tobacco products, the various molecules in the smoke you inhale get stuck inside the alveoli and diminish the efficiency of this oxygen transfer. If you are a smoker of tobacco products and you suffer from shortness of breath, it is because your alveoli are gummed up with smoke particles and cannot process your oxygen fast enough to fuel your body’s needs. When you quit smoking and switch to vaping, you eliminate the vast majority of these smoke particles from your daily intake. Your lungs will not get better overnight, but by removing all the chemicals, carcinogens, and other smoke particles from your nicotine habit, you stop adding more buildup to your lungs, which in turn allows your lungs the room they need to start healing. Your body is always processing gunk out of your lungs, both by absorbing toxins into the bloodstream to be filtered out by organs like your liver and kidneys and by engulfing particles with mucus for you to cough up or swallow. When you start vaping, you give your lungs the advantage in this natural cleansing process, and you might notice that you are coughing up more junk at first as your body purges the tar-like buildup from your past cigarette smoking. Try not to be alarmed as your lungs begin this healing process, but be sure to consult your doctor if you notice anything alarming in your phlegm, such as blood, tissue, or any large pieces of lung tar. In time, your lungs will calibrate to your vaping habit and become as clean as they are able to. What determines how healthy your lungs can become, as well as how long they take to get healthy, is really a matter of individual usage and health history. 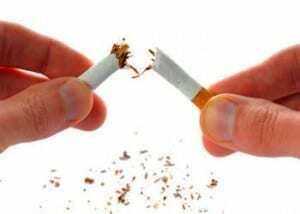 If you have smoked cigarettes or other tobacco products for decades, it is likely going to take your lungs longer to bounce back than someone with a shorter usage period. Similarly, if you have a history of lung problems or other respiratory weaknesses, it can take your lungs longer to recover. It is a good idea to inform your doctor of your plan to quit smoking and start vaping so that he or she can guide you through the transition process and supplement your body’s natural healing with sound medical advice and actions. Keep in mind that vaping nicotine does produce its own particles that can get trapped in your lungs. 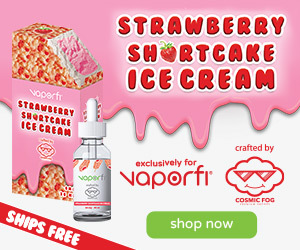 Most vape juices contain a blend of vegetable glycerin (VG) and propylene glycol (PG), both of which are present in the vapor your vape produces for you to inhale. Propylene glycol is a synthetic compound with an array of uses, from antifreeze to food preservation and beauty products. Though generally considered safe, there is some evidence that propylene glycol can act as a carcinogen given high enough dosages and long-term exposure. Compared to cigarettes, however, this risk is quite low, and vaping is still considered a much safer and healthier alternative to smoking. Moreover, the vegetable glycerin is a molecule derived from the naturally occurring oils in certain plants, notably soy, palm, and coconut oils. It is significantly less sticky than a number of the molecules in cigarette smoke that form lung tar and your lungs have a much easier time processing the molecules of vegetable glycerin back out again. Overall, a lot of good things happen when you quit smoking and start vaping. No matter the state of your health, you will definitely save money within your first months of vaping. 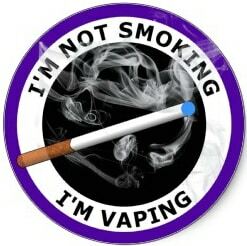 You will also stop breathing in the dense cocktail of chemicals and smoke particles from cigarettes that are associated with black lungs and shortness of breath. Your lungs will be able to start purging tar buildup, and you can reasonably reduce your risk of cancer.